Temperatures in the Valley sky rocketed this past weekend which begged the question, “where can we eat that isn’t too heavy but still satisfies?”. The answer to that, believe it or not, is Z’Tejas! When you normally think of Z’Tejas, you might think of heavier foods such as enchiladas or a smothered chicken burrito. However, they actually have a fairly large selection of entree salads (8 to be exact) which are filling but still light enough to be bearable in this heat! Before getting to the salads, we decided we wanted a light appetizer that wasn’t chips and salsa. 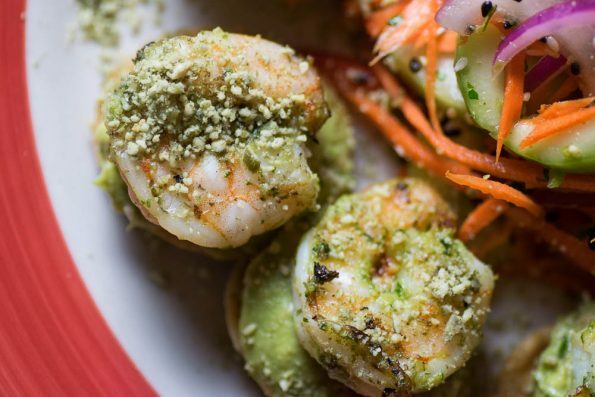 Our server suggested the Shrimp and Guacamole Tostada Bites (cilantro pesto shrimp, house-made tostada rounds, guacamole, chipotle, spicy cucumber salad). These were absolutely stellar! Each component was executed perfectly and they tasted phenomenal! The guacamole is made fresh in house and you can definitely tell by its flavor. The bites are also served with an Asian inspired cucumber salad (which to be perfectly honest, we’d normally skip) that is just as tasty as the main appetizer itself, we found ourselves fighting for the last bites of it! This appetizer could easily make a light meal for one. For our salads, we went with the recommendations of Chef Danny and ordered the Red Chile & Mango Steak Salad (mixed greens, bleu cheese, spicy walnuts, roma tomatoes, and mango citrus dressing) and the Grilled Ruby Trout Salad (cilantro pesto-rubbed Ruby trout, mixed greens, spicy walnuts, goat cheese, and sun-dried tomato vinaigrette). Both salads were very tasty! The protein on each salad was seasoned really well and the salads were not drowning in salad dressing. Both also featured the spicy walnuts which were sweet, salty, and spicy all at once which made them a fun addition to the salad. We joked that the steak salad would be the perfect “man salad” as it is large and loaded with tasty steak and bleu cheese. 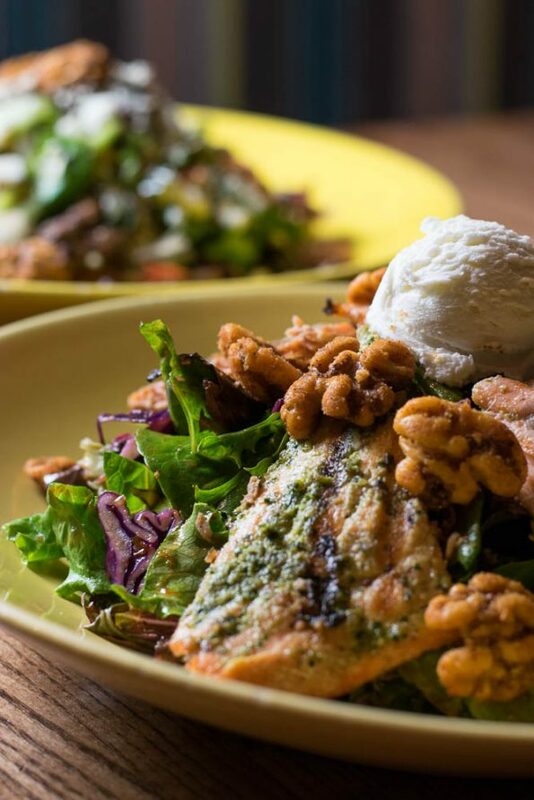 The trout salad overall is fantastic but what really makes it shine (other than the super delicious trout) is the goat cheese, it adds a different dimension to the salad. Pair these with some a flight of margaritas or one of their signature cocktails like the 100 Proof (which features Dulce Vida Blanco, blueberries, lemon and mint) and you have a perfect summer meal! The salad menu at Z’Tejas is definitely worth checking out and won’t leave you disappointed! Where are your favorite places to get a light meal during Arizona’s torturous summer months? Leave a comment below or use the hash tag #GeekEats and let us know! Z’Tejas has 5 valley locations, visit http://ztejas.com/ to find the location closest to you!